This coming Sunday (March 27), Neil Young will be honored with the 2011 Allan Waters Humanitarian Award at Canada's Juno Awards. As we have noted previously, rarely -- if ever -- has a single artist supported so many causes, for such a sustained period, raising considerable funds and awareness while reaching out to millions and millions around the world. When reviewing a listing of benefit concerts that Neil Young has played over the years, one is struck by the sheer diversity of causes he has supported over his 45+ year career. One could contend that no other artist has made such an impact on causes involving social justice. One might argue that Bono would be a contender but we would beg to differ. While Bono's benefit work has been hugely more high profile, his results are mixed at best. Bono's work has been described as "wonkish" by William Easterly, author of "The White Man's Burden: Why the West's Efforts to Aid the Rest Have Done So Much Ill and So Little Good ." While Bono with the band U2 has certainly spoken out numerous times in both song and deed, we would argue that Bono was never willing to put his personal politics ahead of the band's success. 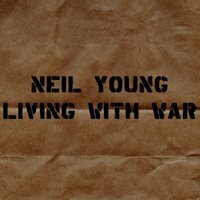 One can only reflect on Young's nearly career suicide inducing release of "Living with War" -- bolding calling for the impeachment of a sitting United States President for lying about an unjust war -- to understand that he places his incredibly fearless positions far ahead of career decisions. Lennon and Young are/were rebels. Bono isn't. Lennon paid a price for his activities. We now know from subsequent Freedom of Information Act releases that the FBI monitored and harassed him. In 1971, President Richard Nixon set in motion a four-year effort to deport him, which failed after the political tide in America turned against the war. In this role, Lennon was continuing a venerable tradition: the celebrity as a crusader against the wrongs committed by those in power. In the 19th century, the celebrity activists were not musicians but writers. Charles Dickens, Ralph Waldo Emerson, Henry David Thoreau and other authors loudly supported the abolitionist crusade against slavery. Harriet Beecher Stowe went further and wrote "Uncle Tom's Cabin" to boost the anti-slavery cause - a sort of 19th-century equivalent of "Imagine." "My job is to be used. I am here to be used. It's just, at what price? As I keep saying, I'm not a cheap date." No one -- no one -- would ever, ever imagine Young making such a cynical statement. We need more high-profile dissidents to challenge mainstream power. This makes it all the sadder that Bono and many other celebrities only reinforce this power in their capacity as faux experts. Where have all the celebrity dissidents gone? It's not a complicated task. All Lennon was saying was to give peace a chance. You've made great art, you've spoken truth to power, and you never sold out. Neil Young is the absolute real deal, never, ever selling out! I've been following him for 20+ years and it's been one helluva ride. So happy i hopped on. check out Neil's comments at 4:55, spoken truly from the heart @Farm Aid! Totally agree with all that you wrote and I would add ... and maybe I'm saying this too strongly, but its almost insulting that people would compare Bono's activism to Neil's ... not to take anything away from Bono because whatever his ultimate motives may be or however mixed they are ('ie' celebrity activist -- who is serving whom?) Bono has in fact been a voice for good and he's deserving of much prasie for that ... Neil on the other hand serves the cause at the expense of, as you so elequently said, his own marketability - that's special ... its Neil's pure motives that set him far apart from someone like Bono ... its also that good form of being rich and famous and maintaining a normal identity that makes him a real person, a great role model, and someone you can look to as an example of a tried and true activist and humanitarian. I would also add -- if you look at who is left from the 60's and still protesting ... ya know, the numbers have dwindled, Neil's never stopped doing it, LWW was a fabulous example, and so, based on this 40 year+ track record he has you can look back and say Ohio wasn't about being a celebrity and trading in that generation's celebrity currency which was protest, that was the same Neil Young as true activist and he is today ... Its just a cool perspective, another perspective on Neil that distinguishes him and his fine charachter. Many musicians have cited him as a huge influence musically. Hopefully the same will hold true for keeping it real and giving some back sincerely. My husband and I have tickets for the upcoming Juno Awards ceremony at the Air Canada Centre in Toronto where Neil will be presented with the Allan Water Humanitarian Award. Well deserved and long overdue. I certainly hope that Neil will be making a live appearance to accept his award. A recent article in the press seemed to indicate that this will be the case, but the newspaper has messed up on things like this before. I've also heard from another source that he plans to appear via satellite. I guess we'll find out for sure in a few more days. @Rusted - thanks for vids! exactly. @Dan1 - thanks for comment. precisely. 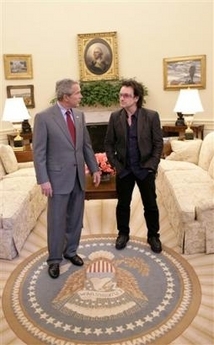 Certainly not trying to knock Bono here at all or his work & causes. But you understood exactly where William Easterly was coming from with Bono, his ego, career, music, and causes. Bono plays it safe with his causes and music relative to Neil. Neil's career is 2nd to his values and causes. It's really hard to find places where he got it backwards and that is why he is -- in so many respects -- where he is today relative to his peers. It's our very firm belief that if any of his peers were to truly confide on their opinion of NY it would be quite revealing of their respect. Again, we'd encourage everyone to revisit the listing of benefit concerts that NY has been involved with. Really. His motives are unimpeachable. As for Lennon, in many ways, he deliberately imploded his career for his causes. No doubt about it. Nixon was relentless in going after his critics like Lennon, Young, and others who protested the Vietnam war. It takes a tremendous amount of courage & sacrifice to do what these guys did. And to this day, very few recognize the enormous courage it took for NY to release LWW & LITP. Truly & utterly courageous. But Lennon would have for sure if he were here today. @ Sharry - have fun!!!! ''Congratulations Neil Young'' A Very deserving award for you. Have fun Sharry. I do not have tickets for the Junos but I am planning to go down to the ACC and walk around with my camera to see what I can see. LINCVOLTing in Toronto! Bono is offensive on multiple levels, but as an Irish citizen, one of the things that rankles most is his tax avoidance. A total hypocrite with a narcissistic personality disorder. Lennon may have been politically naive or misguided at times but had integrity, as does Neil of course. Neil Young is genuine. In Music, actions, thoughts and rhyme. Any other way and we wouldn't be here enjoying it all. Paul McC's and Paul Hewson's knighthood after making a few bucks off their "anti-British" songs sealed their fate with me. Their only saving grace is that at least they have a guilty conscience. Has Neil the same hypocracies? Would he accept an honor like a royal knighthood from a government that was responsible for economic oppression?